How do you automate a job without setting up a dedicated machine? Some mundane tasks can easily be automated. In my case, I needed something that could post to our Confluence instance at a specific time every week. This is because we use blog posts in Confluence for announcing our weekly volunteer meetings and as a simple attendance management. Confluence, a team collaboration software written in Java and quite often used in corporate environments, offers a REST API that makes it possible to perform many operations on the content. In this case, I was interested in posting new content with some text, and I was getting tired of doing that manually every week. So, I thought: “I spend a lot of time on this task. I should write a program automating it!”. "value": "Meeting description goes here." The script uses basic authentication to post the content and, if successful, returns metadata about the post as a response. If it fails, the response from Confluence end-point should point you in the right direction. Now we are one step closer to automation. The script works, and we can post content with a simple push of a button. What now? Well, now I needed something to run that script and something to trigger that action. 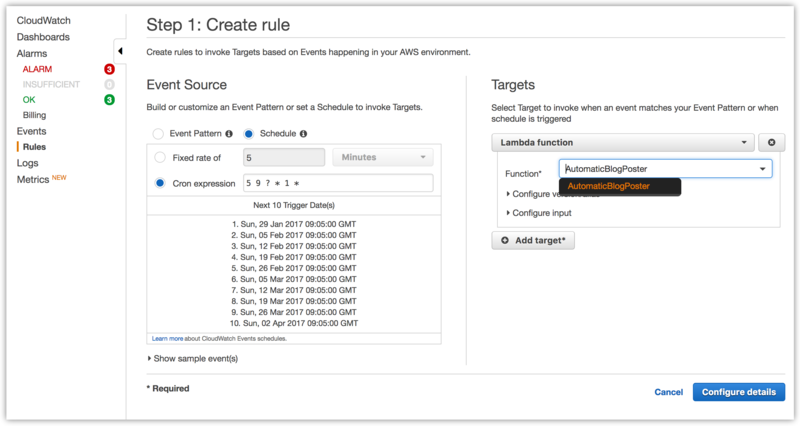 The trigger is the time as I wanted to run our script weekly, but first I needed to deploy our script to the Cloud. Scheduling and triggers would come later. Since we had some infrastructure on AWS already, I decided to deploy the script on the same platform. 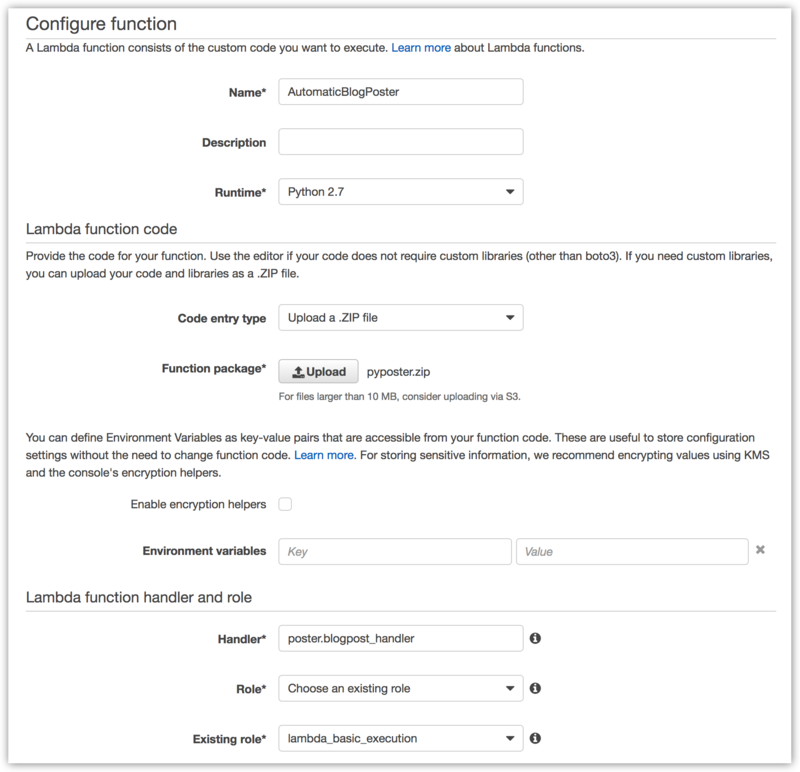 I wanted to deploy it as a simple stand-alone function in the Cloud – in AWS world it is called a Lambda function. And we are ready to deploy to AWS! 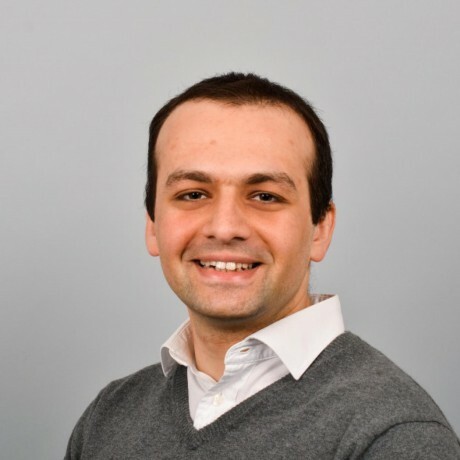 Start with creating a new Lambda Function and selecting a blank function for this job. I didn’t choose any triggers for now and continued to the configuration page. When presented with function configuration you need to give it a name, description, runtime, and a .zip file with the code. At the end, you will need to define a handler (which will typically be filename.function_name), and a role. At the end of the wizard, you can run it manually by pressing the Test button. If you did all the steps above, this should now create a new post on your Confluence. Congratulations, you have now set up a stand-alone function in the Cloud! Now that I have automated the task and deployed it to the Cloud, I needed something to trigger that function. 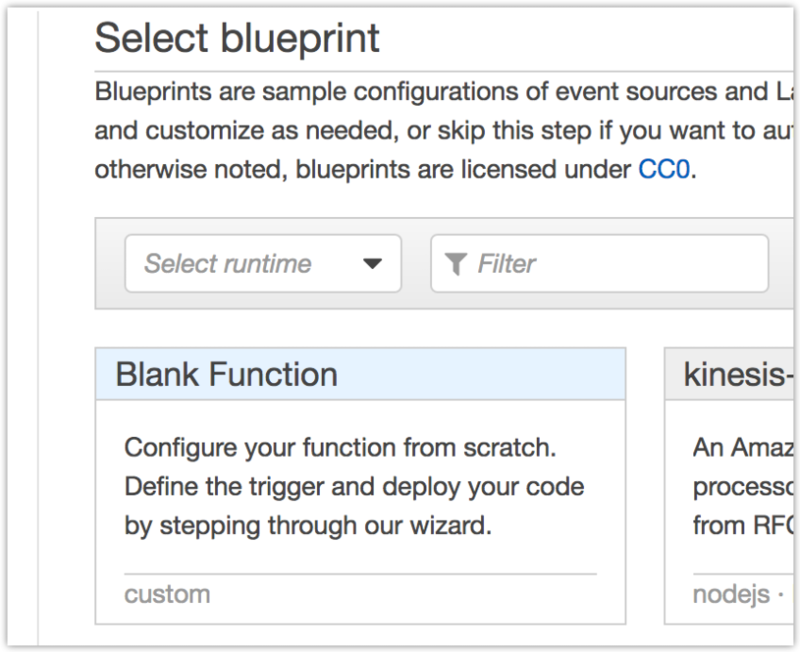 In this case, I wanted to schedule it to run weekly, so function was set to be triggered by the CloudWatch events. It offers a good support for scheduling Lambda expressions. I defined event source as a cron expression, and a target as a Lambda function I created in the previous step. Now you (and I) have a function that is scheduled to run weekly and does not require a dedicated machine to run. It also has some good options for logging and sending alarms in case it fails.